At Vanguard Dental Group we see many Derry children and teens with serious mouth and tooth injuries that could have been prevented had they been wearing a mouthguard. When a tooth is knocked out or broken, speaking, eating, and smiling can become very difficult. We are Drs. Rothenberg and Moskowitz and we recommend that Derry parents encourage their children to wear mouthguards when participating in team sports, skateboarding, skiing, and ice skating. 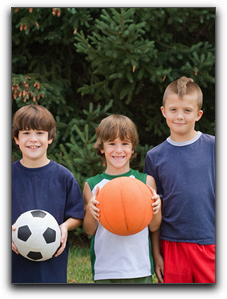 Ask us about custom mouthguards that will fit your child perfectly and offer excellent protection. Stock mouthguards found at most Derry sporting goods stores are also an option, but they might not fit as well. If you or your child is in need of cosmetic dentistry due to an injury or an accident, my staff and I at Vanguard Dental Group offer many restorative procedures. If a crown or dental implant is required to repair your tooth, the staff at Vanguard Dental Group will provide quality crowns made from high-strength ceramic or porcelain with beautiful shape, color, and translucency. Vanguard Dental Group has been offering family and cosmetic dentistry to the people of New Hampshire since 1999. We would love to serve you and your family. We invite you to contact us today to schedule a consultation.